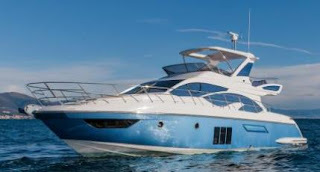 Azimut yachts new 54 is a further tune up of the 53 model launched in 2009, with the main differences coming from a redesign of the profile windows, and an improved interior with a more luxurious decor. Another important difference will be the galley which now features a complete redesign allowing for better layout. For the rest the new 54 keeps the clever layout of the 53, which features the much appreciated three double cabins layout, and a full beam midships owners stateroom. Power is twin MAN 730hp engines with a max speed of 33 knots.